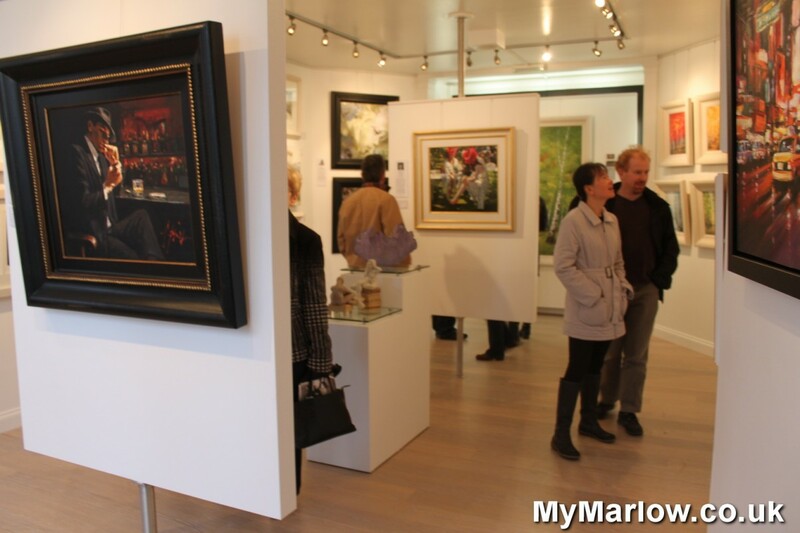 Lemongrove Gall ery opened the doors on their new Marlow gallery today, adding to their four other locations in the South East, including one just along the road in Henley. Terri, an Art Consultant, told us that they had received a fantastic reception from visitors during the day – a warm welcome from residents who were pleased to have a gallery added to the rosta of other shops in Marlow. Lemongrove specialises in contemporary works – original paintings in oils and acrylics, limited edition prints, and sculptures. Each featured artist is represented by a selection of works, and currently includes some limited edition prints by household name Rolf Harris. Other artists that stood out included Rebecca Lardnerwith her quirky and appealing harbour scenes, together with the night-time cityscapes of both Henderson Cisz and Csilla Orban. Prices of works currently displayed ranged from around £200 up to an eye-watering £22,000 for one original oil! Terri and Alexandra of Lemongrove, Marlow. Gallery manager Alexandra Rosca told us that the display will change regularly, with a variety of special exhibitions lined up – occasionally including a visit by one of the featured artists. The first of these visits will be on the 20th November, when Philip Gray – well known for his atmospheric seascapes – will be giving a painting demonstration to launch a new exhibition of his work. Lemongrove are the The Brewery House, 74 High St… or next to Zizzis. On our visit, the atmosphere was relaxed – allowing for enjoyable viewing without undue sales pressure, so why not go and see it for yourself. Next articleCollective Art in Marlow – who are they?